Alternate universe ST:TNG would’ve had Asian Americans as Data and Tasha Yar! I’m a huge fan of Star Trek: The Next Generation, so it was with a certain amount of fangirl glee that I stumbled across this digitized memo from Paramount Studios. The memo (which found its way online in 2010) dates back to April 1987, and it lists some of the short-list casting considerations for some of our ST:TNG first season bridge crew. There are some expected entries — Patrick Stewart as the favourite for Picard, and Jonathan Frakes winning out the role for Riker (spelled with a “y” in this memo) And, of course, Trekkies like myself were aware that Denise Crosby was initially considered for Troi. Many African American actors of note, including Wesley Snipes and Tim Russ (who would go on to star in Star Trek: Voyager) were on the short-list to play Geordi Laforge. 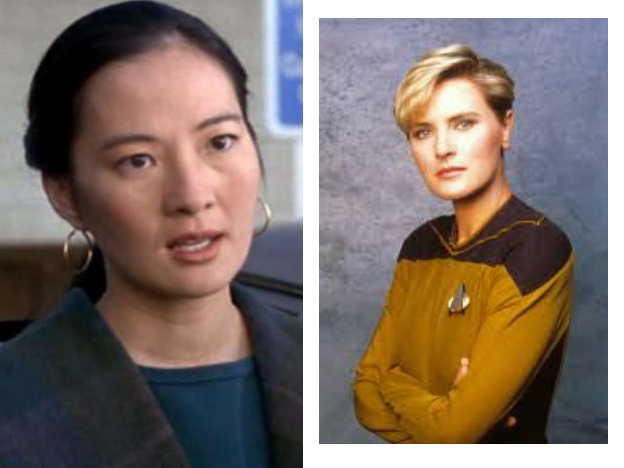 And, in an alternate universe, Rosalind Chao would’ve been Commander Tasha Yar, the hot-headed and tomboyish head of security. As Trek lore goes, Chao was a favourite for the role until Marina Sirtis auditioned for Troi; Rodenberry then decided to bump Chao’s casting and move Crosby to Yar’s role. Chao, who later appeared as Keiko O’Brien on ST:TNG and Star Trek: Deep Space Nine, would’ve — I think — revolutionized images of Asian American women in science fiction. An Asian American Yar is tough and no-nonsense, but also struggles with her femininity and sexuality, undermining chances that Chao’s portrayal would’ve spun off into a “dragon lady” stereotype. But then there are a few surprises. Paramount was already toying with the idea that it might be ST:TNG, not Star Trek: Deep Space Nine that might give the franchise its first African American Starfleet captain; esteemed actor Yaphet Kotto was considered a competitor for Patrick Stewart in the role of Picard. Kevin Peter Hall, another African American actor, was in the running for the role of Data. Posted on July 12, 2014 July 12, 2014 3 Comments on Alternate universe ST:TNG would’ve had Asian Americans as Data and Tasha Yar!